Happy Spring, friends! Technically, we’ve been there since the equinox back in March, but for those of us in western Canada, spring has been dragging its feet. Blizzards in April! It’s only in the past week that the temperatures have warmed, the snow has gone, and the ditches have flooded. 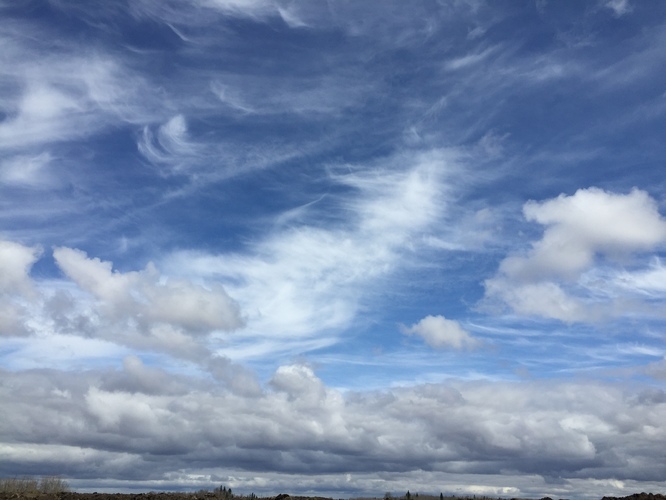 Just ten days ago, Alberta saw its last snowstorm of the season, and today, it’s +20C. Sure beats the weeks of -30C. Let the growing season begin in a mad rush, as it always does. We couldn’t be gladder to see it! Things are leaping into action at Larch Grove as the weather warms. We were in a holding pattern on the farm for much of March and early April, waiting, waiting, waiting…to see how the new road would hold up come melt, to start the build on our new farmhouse, to get the seeds sown. Now it’s just about time to get rolling on all those things. Yup, there’s still a gigantic puddle of runoff water in the market garden, but as the ground warms up and the frost line recedes, the soil will dry and it’ll be time to plant at long last. 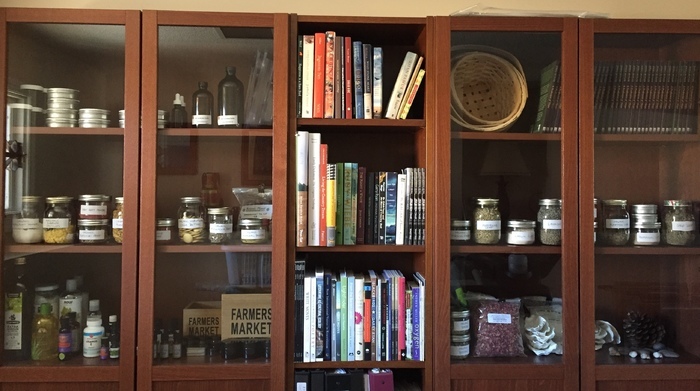 While we waited out the mercurial weeks of April, I put some of my recent herbalism course to work, creating and refining recipes for the balms and salves we’ll use on the farm during the summer. 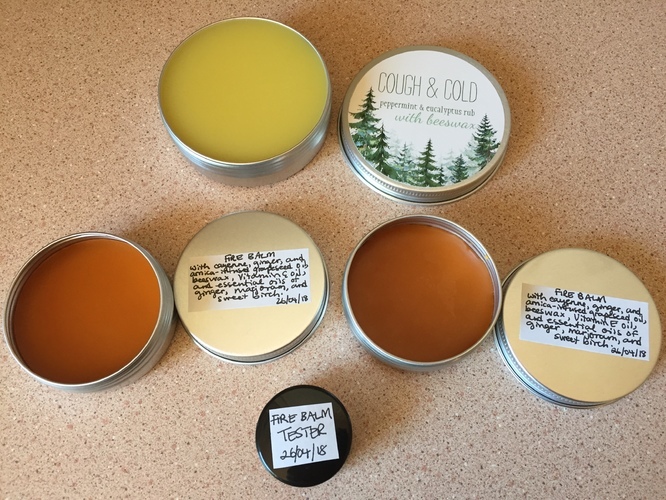 I focused on what I call Fire Balm (a homemade version of Tiger Balm) for screaming muscles at the end of the day, and Cough and Cold Balm, which is just as good for easing a congested chest as it is for icing sprains and strains. I’m using it now to chase a spring cold out of my body – having just finished the teaching term and its intense marking load, I don’t have time to lose to a cold, not when there’s gardening to do! Thomas has been teaching, too, as a substitute (he didn’t get very far into retirement, ha! ), and although the school year wears us out, it’s also good fun and helps support all the building we’re doing on the farm. Win win. Healing balms cooling in the kitchen. Home apothecary. We’ll be growing many medicinal herbs on the farm this summer: calendula, lavender, anise hyssop, lemon balm, and more, and sustainably wild-harvesting violet leaf, bush tea, spruce tip and pitch, willow bark, balsam poplar, and wild mint. After a decade of scrimping, planning, saving, and dreaming, our farmhouse is about to become a reality at Larch Grove. From 2008-2011, we lived in a truck camper, which was a huge adventure in tiny living, let me tell you! In 2011, we worked with our friend Mark, who built hunting cabins at the time, to design our 250-square-foot cabin, which completely changed our quality of life out at the farm for the better. 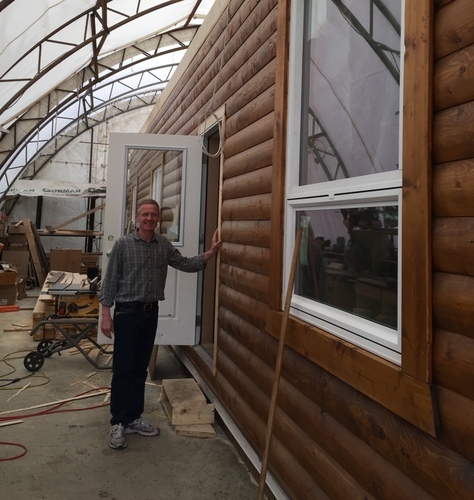 Mark now builds larger cabins for a living, and we’ve been working with him on the design for an off-grid farmhouse. This summer, we’ll have a full farmhouse on the land, complete with storage pantry and wood cook stove. The plans have been in our heads for so many years that it’s hard to believe the farmhouse will soon actually exist. What a journey! Checking out a cabin in process at Mark’s workshop. There’s so much we’re excited for as the growing season kicks into gear. The new pond on the hayfield, where the road fill was drawn from, is close to half an acre in size and is beginning to fill with wild water from the land. We’ve been working on the perimeter ditches on the field, too, in order to channel meltwater and rainwater into the pond. In another week or so, it’ll jitter to life with frogs, toads, and likely some migrating waterfowl. The new road through to the hayfield was finished in January, and now it’s a case of monitoring how it withstands its first spring melt and runoff. Seems to be holding up well so far – which is incredible, as it’s a floating road across the muskeg on a base of geotextile. This is the road we’ll be using for farmhouse materials in the summer, so it has to be sound. And, of course, there’s the joy of starting the old garden and greenhouse, tending to the bees, and starting to prepare the hayfield with organic cover crops to eventually become our new garden on higher ground. This summer going to be so much work, but we’re grateful for every task that has us outdoors under the sky. Some of you have nudged me gently and cautioned me not to go at things too hard while being ill, and I confess to being grateful for the care and the warning. I do have a tendency to get excited and take on too much, but I’m keeping an eye on energy and strain right now to be certain I don’t charge into the growing season and burn out. I’m also grateful that Thomas and I are a strong team, and he calls me on it when he sees me getting overtired and tells me to rest. All of this is to say that I truly appreciate the kindness, friends, and I will definitely curb the seasonal urge to try everything all at once (hard as that might be!). I hope spring is rolling in at long last wherever you are, chasing out the stasis of winter and bringing with it grand new energy. Here’s to longer days, wild things flourishing, and light, light, light. Posted April 26 2018 in Farm, Garden, Animals, Birds.